The California chaparral offers a variety of great forage for bees, and with the rains we had in January we're already seeing some really robust blooms. 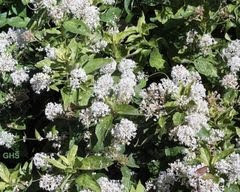 Right now the ceonothus is blooming, making parts of the hills look like they got a very light dusting of snow. Tiny flowers in clumps, somewhat lilac-looking from a distance, and very sweet-smelling--- which is why it's also known as California Lilac. The bees LOVE 'em, and my handy reference book about chaparral flora says this is an important food source for bees. Bottom line is, I'm gonna check stores this week and see if they're full. If they are, I'll throw some supers on and try to get some VERY early honey harvest.